FROM THE DAYS OF CAIN AND ABEL TO THE LAST AND FINAL INSPIRED WORD TO THE CHURCH, SACRIFICES HAVE BEEN CENTRAL TO MAN’S RELATIONSHIP WITH GOD. BECAUSE OF SIN AND MANKIND NOT ONLY THE PHYSICAL PARADISE WAS LOST, BUT MORE SO THE CLOSE RELATIONSHIP WITH GOD. OUR RIGHTEOUS FATHER CALLS FOR SACRIFICE TO RESTORE THE DAMAGE OF OUR SINS. THE FIRST RECORD AFTER THE FALL OF MAN IS THAT OF CAIN AND ABEL COMING TO PRESENT TO GOD AN OFFERING. REFERENCES TO NOAH AND ABRAHAM TELL OF THEIR SACRIFICES MADE TO GOD. JOB WAS A RIGHTEOUS MAN WHOM GOD SAID WAS BLAMELESS BEFORE HIM. JOB WAS DILIGENT IN MAKING SACRIFICE TO GOD, EVEN FOR HIS FAMILY. WHEN GOD GAVE THE LAW TO ISRAEL SACRIFICES WERE INCLUDED SO THAT ISRAEL WOULD DEVELOP A HUMBLE SPIRIT BY WHICH THEY COULD DRAW NEAR TO GOD. THE ANIMAL SACRIFICES WERE MADE OVER AND OVER AGAIN. THESE RITUALS WERE ONLY THE FORESHADOW OF THE ONE GREAT SACRIFICE THAT WOULD TAKE AWAY OUR SINS. WE ARE REMINDED IN OUR WALK WITH THE LORD THAT IT WAS NOT JUST THE LORD JESUS CHRIST WHO WOULD SACRIFICE, GIVING HIS LIFE A RANSOM. THE REMAINDER OF THIS LETTER TO THE CHURCH IS A CALLING TO LIVE THAT SACRIFICIAL LIFE. PAUL TELLS HOW HE HAD BECOME THAT LIVING SACRIFICE. GAL. 2:20-21: “I HAVE BEEN CRUCIFIED WITH CHRIST AND I NO LONGER LIVE, BUT CHRIST LIVES IN ME. THE LIFE I LIVE IN THE BODY, I LIVE BY FAITH IN THE SON OF GOD, WHO LOVED ME AND GAVE HIMSELF FOR ME.” THE RHETORICAL QUESTION HE RAISED IN THE DOXOLOGY AS TO WHETHER ANYONE COULD EVER GIVE TO GOD SO THAT GOD OWED MAN IS BEING FURTHER DISCUSSED. THE APOSTLE MAKES IT CLEAR THAT RIGHTEOUSNESS IS NEVER ATTAINED BY WHAT SINFUL MAN CAN DO, BUT RATHER ONLY THROUGH THE SACRIFICE CHRIST HAS MADE. 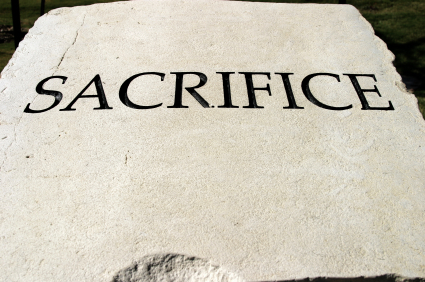 JESUS CALLED PEOPLE TO MAKE SACRIFICES IF THEY WOULD FOLLOW HIM. ANDREW, PETER, JAMES AND JOHN LEFT THEIR FISHING BUSINESS TO BECOME FISHERS OF MEN. MATTHEW WAS CALLED FROM HIS WORK AS A TAX COLLECTOR. OTHERS WHO WERE WITH HIM WERE TAUGHT TO THE COST OF FOLLOWING HIM. SOME WANTED TO WAIT TO ANSWER HIS CALLING UNTIL PARENTS WERE GONE SO IT WOULD NOT SEVER EARTHLY RELATIONSHIPS. JESUS CALLS US TO SERVE. THE RICH YOUNG RULER WHO CAME TO JESUS WANTING TO SECURE ETERNAL LIFE WAS A MAN OF GOD WHO OBEYED TO THE LAWS OF GOD. BUT HE KNEW SOMETHING WAS STILL MISSING IN HIS LIFE. JESUS CALLED HIM TO MAKE THE SACRIFICE OF ALL OF HIS WEALTH, THEN HE SHOULD COME AND FOLLOW HIM. I THINK IN OUR PRESENT TIMES WHEN WE ARE SURROUNDED WITH SO MANY THINGS AND CONVENIENCES, WITH SO MUCH TO MAKE LIFE EASY AND RICH AND FULL; THAT LIVING A SACRIFICAL LIFE IS DIFFICULT TO SEE, COMPREHEND AND PERHAPS EVEN TO ACCOMPLISH. IF, HOWEVER, WE WERE LIVING UNDER PERSECUTION AS MANY CHRISTIANS HAVE AND ARE; AND IF WE LIVED UNDER THE THREAT OF LOSING OUR THINGS, IMPRISONMENT AND POSSIBLY LOSING LIFE FOR FOLLOWING JESUS IT WOULD BE CLEARER TO US THAT LIVING FOR JESUS IS A LIVING SACRIFICE. HELP US TO BECOME THE LIVING SACRIFICE SO THAT ALL WE ARE AND ALL WE CAN BE AND ALL WE HAVE IS IN YOUR HANDS.MAY YOUR WILL BE DONE IN US.